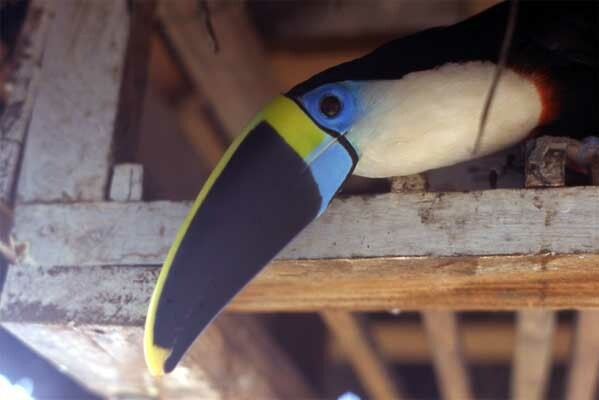 The toucan is an Amazon icon. Actually, there are at least a dozen species, plus twenty or so of the related but smaller toucanets and aracaris. 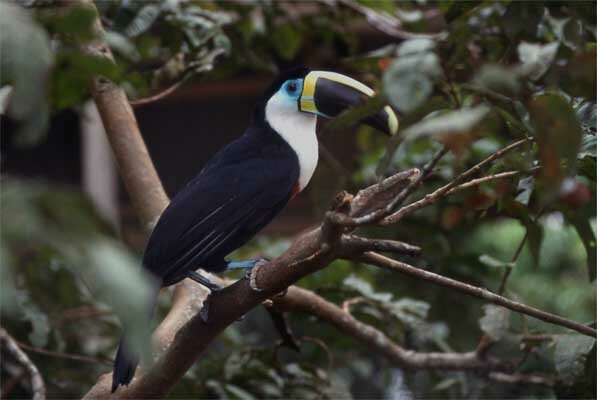 The species pictured here is probably the White-throated (Cuvier's) Toucan (Ramphastos tucanus) which can only be told apart from the Yellow-ridged Toucan (R. culminatus) by its call. The seemingly ridiculous bill is almost hollow, hence very light and it's not certain why it is so huge. It probably helps the bird reach fruits at the end of a branch, or to probe into tree holes for small animals or even nestlings and eggs of other birds. This species of toucan readily adapts to living around people and is often seen as a pet in people's homes or at tourist lodges. It fares well in captivity, and will readily take offered food, such as bananas.